August 14, 2013 -- Steve Torrence enjoys fishing, but he won’t have the time this weekend to try to reel in a famous wall-eye pike from one of Minnesota’s 10,000 lakes. He is more intent on adding points to his Mello Yello Racing Series stash. The pike will always be there, but the opportunity to claim one of the 10 starting slots for NHRA’s famed Countdown to the Championship is definitely at the top his list. The Top Fuel driver from Kilgore, Texas is currently 10th in the points standings. He is determined to stay there – or increase his advantage over 11th-place David Grubnic – during the Lucas Oil Nationals, Aug. 16-18, at Brainerd International Raceway in the scenic Brainerd Lakes area of Minnesota. 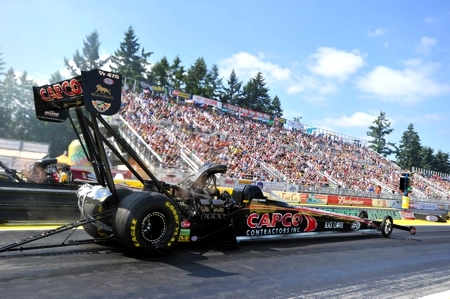 “The track is a long way from Minneapolis (130 miles),” said Torrence, driver of the Torrence Racing/Capco Contractors Inc. Top Fuel dragster. “It is a good place and a pretty place to race. They have a lot of great drag racing fans up there. The ones who stay overnight are lined up early in the week to make sure they get into the camp grounds. This is a numbers game for Torrence, who has 741 points, and David Grubnic, who is 11th with 663. Only one more race – the exciting 59th annual Chevrolet U.S. Nationals, Aug. 30-Sept. 2 – remains before the Countdown starts its six-race battle for the championships. “We want to get every point possible,” Torrence reiterated. “We’d rather be guarding the position like we are instead of trying to catch someone. We will do what we can to hold that lead.